I love the versatile nature of chickpeas; in fact I’m borderline obsessed when it comes to these little beige morsels. Mashed, fried, baked or left as they are; they never fail to give me inspiration for a heap of ways to use them. 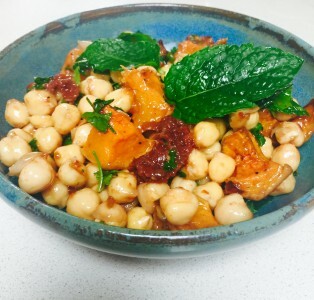 One of my greatest successes on MasterChef was feeding the 2014 finalists and winner; Ping Luke and Jack my spiced chickpeas with sea bass and chermoula. They are a great flavour sponge and as long as you treat them with respect, they will love you right back! This salad works really well on a buffet table for a barbecue, a light lunch as a low carb option, or in the evening for dinner with some grilled salmon, chicken or extra roasted vegetables and fresh spinach leaves. 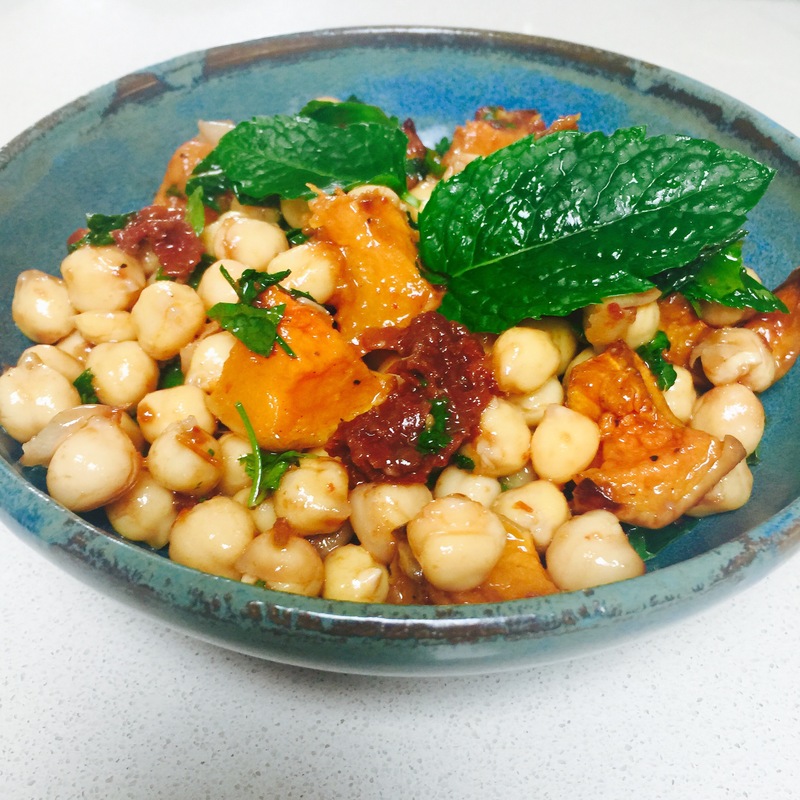 You can substitute fresh chickpeas for canned if you want to prepare this in a hurry, but I personally prefer the extra nuttiness you get with freshly cooked ones. Just make sure you soak overnight and boil until tender in plenty of water. I check mine after 45 minutes but they usually take a little more than an hour. My latest trick is boiling them from dried in my pressure cooker for 45 minutes! Feel free to adapt the herbs or add some extra ingredients; finely chopped red onion would also work nicely. Tip: I like to toss the chickpeas, dressing and squash together when they are all warm. If you are not planning to eat this straight away, leave the herbs out and stir through just before serving. Drain the chickpeas and rinse well. Add the chickpeas to a large saucepan and cover with plenty of cold water. Bring to the boil and cook for around 50-60 minutes until tender, then drain and cool. Pre-heat the oven to 200 deg. 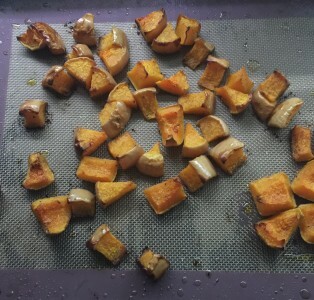 Line a baking tray with some baking paper and add the butternut squash. Drizzle over the olive oil, sea salt and some black pepper and mix together. pop in the oven and roast for around 30 - 40 minutes. Turn a couple of times; you want it caramalised and tender, not burnt! Once cooled, remove the skin from the squash. To make the dressing: add the red wine vinegar and tomatoes to a small saucepan and put on a low heat. 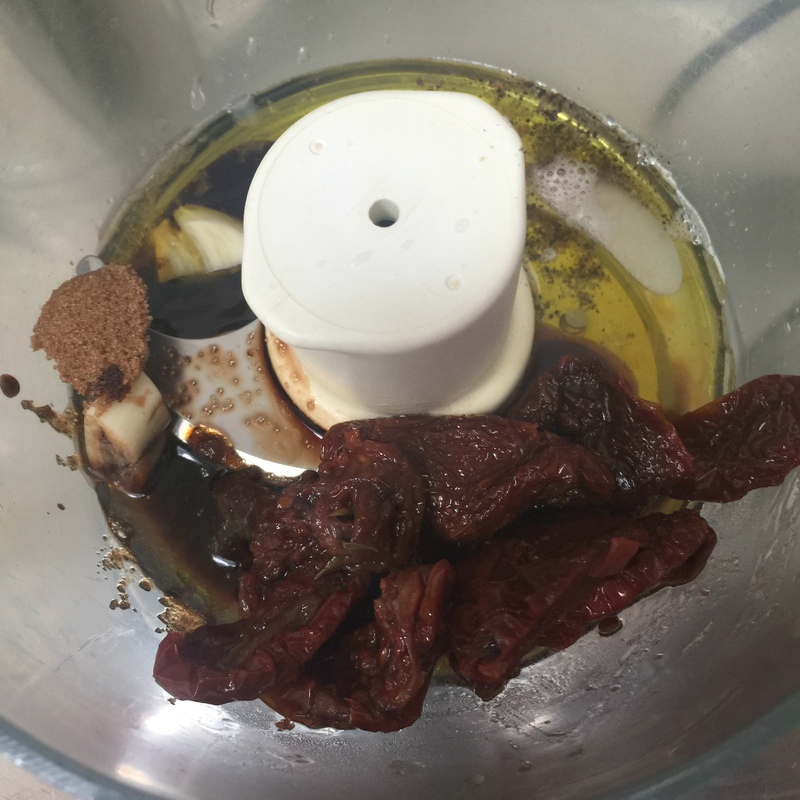 Allow the tomatoes to soften in the vinegar for a few minutes, then transfer the contents to the bowl of a food processor. Add remaining dressing ingredients; sugar, balsamic, extra virgin olive oil, lemon juice and garlic. Pulse a few times. You want the mixture chunky and not pureed. Mix the squash, chickpeas and dressing together and season with some black pepper. Stir through the freshly chopped coriander and mint leaves and serve! a perfect meal for Meatless Mondays – love pumpkin.